We are combining the newsletters for March and April to bring you a bumper edition. April is not yet finished but already there is much to tell you. 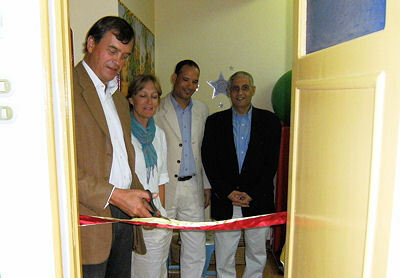 In March, Little Stars was honoured with a visit by the British Ambassador Sir Dominic Asquith who was accompanied by his wife and the Honorary British Consul Ehab Gaddis. The visiting party were greeted by Nagar Khalifa who oversees the centre when the chairman is in the United Kingdom. Sir Dominic first visited the clinic in October 2008 and was impressed with the developments that had taken place since then. 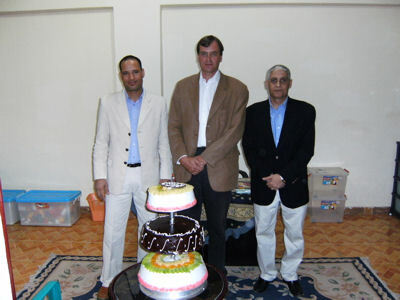 Sir Dominic Asquith, Mr. Ehab Gaddis and Nagar Khalifa at the opening of the new dental surgery. 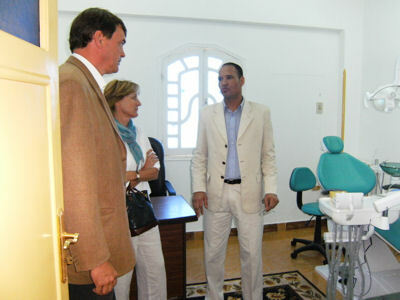 The visit was combined with the opening of the new dental surgery which the British Embassy had helped to create through a substantial grant from the Port Said Fund. After Sir Dominic cut the ribbon to open the surgery, the visitors looked at all aspects of the clinic and inspected the building work that is being carried out upstairs on the new Training Centre for women. Particular interest was shown in Little Stars’ family sponsorship scheme and they looked at all the family records which are kept up to date by Nasser our Needs Assessor. 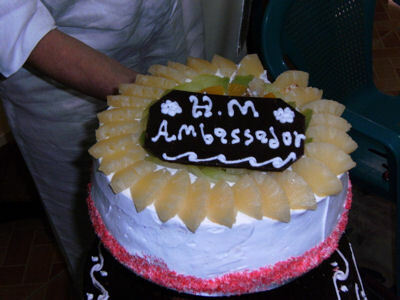 The visit was considered a great success and we are extremely grateful to the Ambassador for giving us his time. 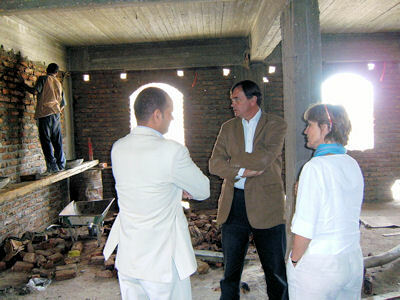 Sir Dominic and his wife showed great interest in the sponsorship scheme and the new Training Centre. In mid-March, just before the Ambassador’s visit, we received news from the Egyptian Social Services that our application to become an Egyptian registered society had been accepted which means that at long last we have all the necessary licenses to operate the clinic as we wished and to open the nursery school. All our projects were seriously delayed while we were waiting for the paperwork to be completed. In all it took fourteen months from the submission of the application to its completion. At one stage we were waiting for 21 separate signatures which seemed an insurmountable task and we almost lost hope of completion. The registration will make little difference to the way in which Little Stars is organised and managed, it is simply a book-keeping exercise for the running of the clinic and the nursery school but it does keep us entirely within the law of both countries. It also means that the clinic will be closely supervised by the Egyptian Social Services and inspected regularly which is something that we welcome. Responsibility for the sponsorship programme and the distribution of food parcels remains entirely with Little Stars UK. Little Stars has a policy of complete disclosure over all aspects of its work, including financing. The estimated cost of the application was around £1,750 - £2,000 in lawyers’ and court fees in Egypt to obtain the necessary documentation that we needed. This cost had to be justified to the Trustees. We are primarily a British charity and will remain so but the chances of obtaining the mandatory licenses without Egyptian registration were extremely remote. 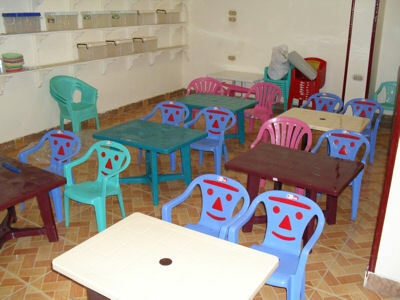 Without the licenses we could not operate the clinic or our education programme. With this in mind, Egyptian registration was vital. The house above collapsed in March and is being rebuilt by volunteers. The house above is dangerous and about to collapse. 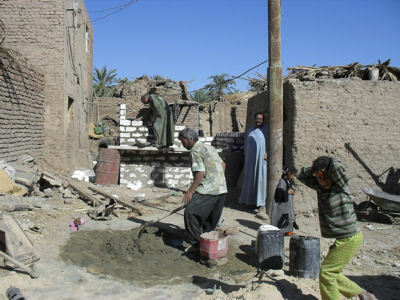 January saw several days of torrential rain in Upper Egypt which caused flash floods and led to the death of an English tourist in Aswan which is to the south of Luxor. Rain of that intensity severely weakens mud brick buildings. 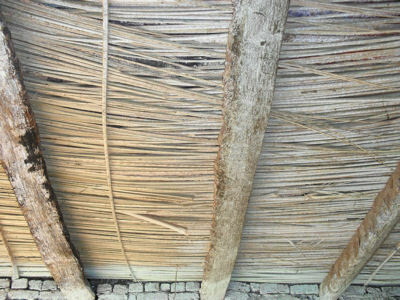 To make matters worse, during March there were periods of very high winds and dust storms which removed the straw which is the main covering of many roofs. The families do not have the money to pay for repairs so to help, Little stars has embarked on a series of wall and roof repairs. The house of one of our sponsored families collapsed completely and is now being rebuilt with the help of neighbours and a grant from Little Stars. The house had been home to an elderly man who had previously suffered a stroke and to his young wife and three children. We learned that he had died in March but we were not able to ascertain whether or not this was linked with the collapse of the house. Our sponsorship programme started at the beginning of last year with just one family and now there are approaching sixty families in the scheme involving more than 250 children. Making up food parcels and providing clothing for the families is now a major task. Some of our sponsors have donated lump sums so that the houses of their families can be upgraded more quickly and we have managed to upgrade three houses in March with the help of the extra donations. Roofs were repaired, electricity made safe, fans installed and where possible a new cooker was bought to prevent the use of open fires where small children were running about. Beds are still a priority. 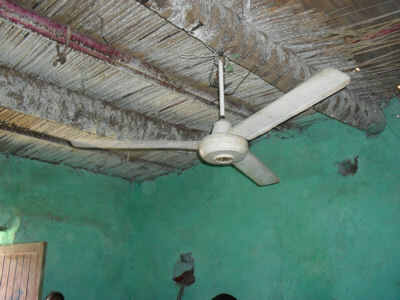 Roofs are repaired and ceiling fans added to combat the intense heat of summer. In April, Little Stars was able to pay for a further batch of cookers (complete with gas bottles, valves and fittings) which were distributed to families in Haja Marise. 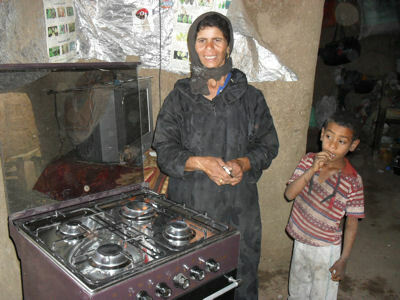 More cookers will be bought as soon as funds allow and these will be distributed in the villages around Nage Birka. 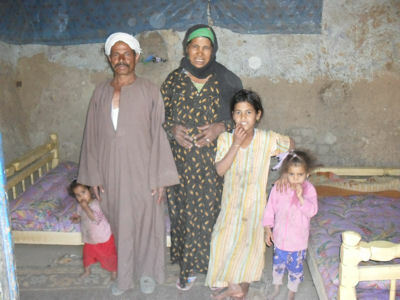 Beds are still a priority with new families with the need to get children off the floor where they would be vulnerable to vermin and scorpion attacks. The next priority, especially where there are babies in the house, is the provision of a second-hand fridge, so that what small supplies the family has can be kept fresh. 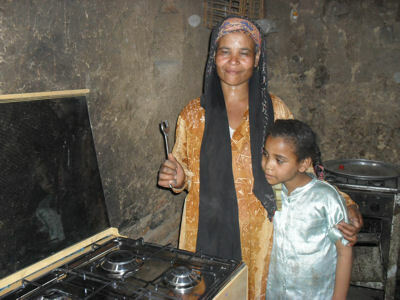 The smiles on the faces show just how proud the mothers are of their new cookers. We have noticed an increase in the number of children with skin infections. We treat these by bringing the children to the clinic so that they can be bathed before they see the doctor to receive treatment. However, with no running water in their homes for washing clothing, the incidence of re-infection is very high. 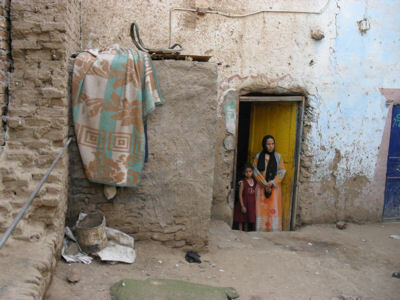 When we have secured our own transport we will be able to collect susceptible children for bathing on a regular basis. Work on the new Training Centre is progressing well and all the internal walls are now in place. Electricity is being installed and windows and door frames are being added. Discussions have taken place over the best approach to take with the classes and we are monitoring literacy and health classes that are being run by a French group to the south of Luxor. When building is finished further equipment will still be needed and we hope to gather sufficient funding to buy sewing machines, looms and hairdressing equipment. Some of our supporters are already gathering equipment for the Hadana. 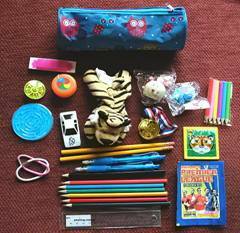 We have been able to buy all the major items needed but we still need a regular supply of consumable items to replace those used by the children. If you have links with a carrier that might help us get items to Luxor then please let us know. Charity shops in the United Kingdom have stopped taking old sewing machine so there are machines out there that are no longer wanted by their present owners. We can use them but only if we can get them to where they are needed. 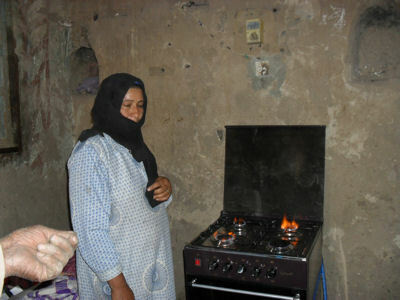 Once in Luxor they can be used to help women into self-sufficiency but at present the cost of shipping is prohibitive. 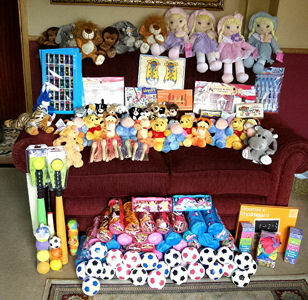 Items for the Hadana collected by Ron and Tracey Cox. We have decided to keep the nursery uniform very simple with yellow ‘T’ shirts that can be bought in bulk and provided by Little Stars. We still have to consider the problem of laundering items for those children in homes with no water supply but this problem will be tackled. 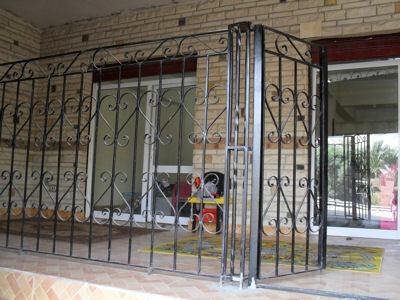 A wrought iron fence with a lockable gate has been built across the front of the nursery school to ensure the safely of the children. A fence protects the children. Play houses have been put together and tables and chairs put in place. Work on the Hadana became intense once the paperwork was complete. 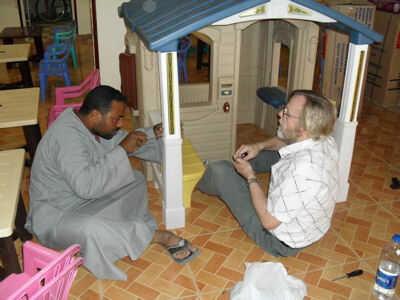 The play houses bought in Cairo were put together by Mick Tindale our Treasurer and Nasser our Needs Assessor. The tables and chairs were put in place and a carpenter engaged to put in pin boards so that the children’s work can be displayed and a strong cupboard that will securely stand the weight of a television is being built. DVDs such as “Shaun the Sheep” and others that do not rely on language have been brought out from the UK. As Little Stars is completely without religious bias, the school will be open to children of all religions. Consequently, as it is impossible for us to teach the necessary variety of religions to such young children a decision was made to not teach religion at all but to leave this part of their education to their parents. Our website, which we try to keep as up-to-date as possible, has now had more than 27,000 visitors and is the main way we communicate with our sponsors and supporters. We have been updating all our projects and have added photos and reports of the work we have carried out repairing houses. We are nearly at the end of our third financial year which ends of the 29th May and, as in previous years, we will upload the accounts onto the website as soon as they have been approved by our external assessor. Each year support for Little Stars has grown and with your help we hope to maintain this growth during the coming year and to expand the work that we are doing so that we can improve the lives and prospects of many more severely disadvantaged children in Luxor.